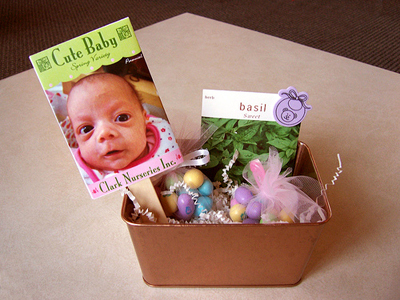 For Lauren's baby shower, made these seed packets to go with the favors. Since she was born early she had her shower after her birth and got to be featured on her favors. Looking back at that project gave me an idea. 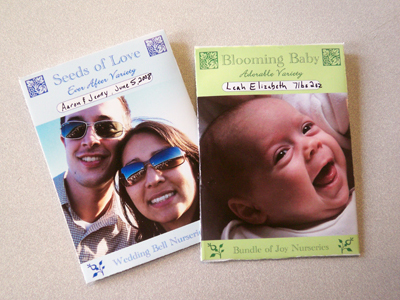 I designed photo seed packets that can be used for wedding favors or baby birth announcements. The project seems timely because spring always seems to bring lots of weddings and babies. You can download the templates here and there are also step by step instructions. It helps if you have photo editing software, so you can add the pictures before you print them out. That is so awesome..thanks for the download! Love love LOVE your ideas!!! That's the most charming idea I've seen you come up with yet! Very cool. Thanks so much for sharing the template! You come up with the greatest print projects for photos! Also do you have a blank template without the colors and designs? I'm a digital scrapper and it would be nice to be able to coordinate it with my other papers in a gift basket. You rock for sharing your ideas! Yeah I love the new banner! Adorable! You always come up with the coolest projects. The new banner is nice and springy! Just love these! How wonderful of you to share.